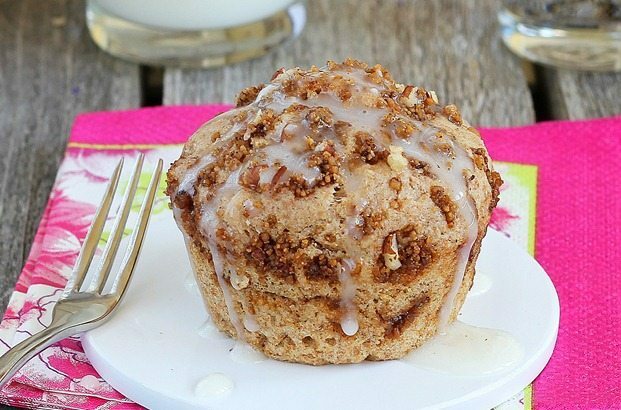 This is a delicious single serving coffee cake in a mug. This delightful and easy recipe comes from one of America’s new baking stars, Katie. 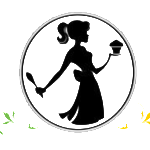 She has created one of the Top 25 Food Blogs in America with her blog, Chocolate Covered Katie; The Healthy Desert Blog. Katie has been featured on The Today Show, CNN, FOX, Dr. Oz, The Huffington Post, and ABC’s 5 O’Clock News. Her favorite food is chocolate, and she believes in eating dessert every single day! We think you will love this recipe. The nutritional info above includes both the streusel and cake ingredients. If using the oil version, add 85 calories and 10 grams fat, which will make the recipe 6 ww points. 1. Preheat to 330 Fahrenheit if opting to bake instead of microwave. 2. Combine batter dry ingredients and mix well. 3. Add wet and mix until just mixed. 5. Fill a greased muffin tin 1/2 way with the batter (or use a ramekin or mug, if using the microwave). 6. Sprinkle on two-thirds of the streusel, then spoon the remaining batter on top. 7. Sprinkle on the rest of the streusel. As we mentioned earlier, this recipe comes to us from Katie, directly from her blog Chocolate Covered Katie: The Healthy Dessert Blog. Katie has been featured on The Today Show, CNN, FOX, Dr. Oz, The Huffington Post, USA Today, The Food Network, Bon Appétit, Cooking Light, People Magazine, the MSN, Yahoo, and AOL homepages, and the ABC 5 O’Clock News. Her favorite food is chocolate, and she believes in eating dessert every single day! Katie eats chocolate every day and sometimes even has cake for breakfast! 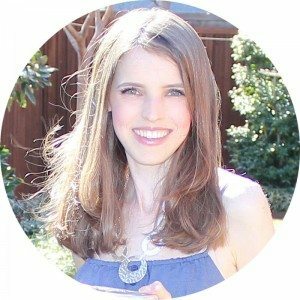 After creating a small food blog just for fun, Katie watched the blog suddenly skyrocket in popularity, quickly becoming the #1 source for healthy desserts and comfort food recipes and ranked as one of the top 30 cooking websites on the internet – with up to 6 million viewers each month! The Huffington Post selected Katie as one of their Best Healthy Food Instagram accounts to follow, and Amazon chose her debut cookbook as one of their Top 20 Cookbooks Of 2015. 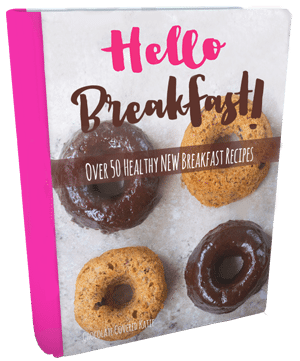 A Chocolate Covered Katie breakfast cookbook, filled with over 50 healthy new breakfast recipes – both sweet & savory.